This is one of our most popular WordPress courses. We can deliver this two day course at your premises or at a convenient local location. We have training venues in Swansea, Cardiff, Bridgend, Barry, Bristol and London. We also offer on-site training at your premises. Our courses are very flexible and we are always happy to adapt our content to suit your requirements. This course is aimed at anyone who wishes to learn how to create their own website or blog using WordPress.org. The course covers every stage from buying a domain name to creating and publishing your website. No previous website experience is required. Attendees will create their own practice website during the course. 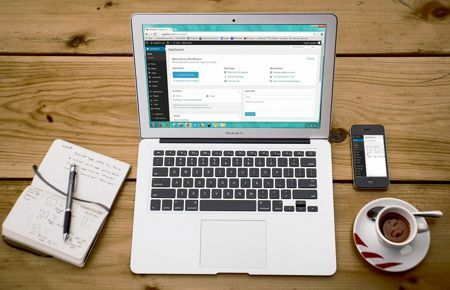 The practice websites are available for attendees to continue to use for a month after the course is completed to enable them to continue to practice their new WordPress skills. “I was a complete beginner when it comes to website design but Rachel was brilliant. She is very friendly and professional and has a lot of patience! I feel a lot more confident now about designing my website. I would recommend this course to anyone who wants to learn about WordPress”.